It was my friends birthday and I wanted to make her a cake. She has a dairy allergy and as I wanted a cake that I could also eat (is that so bad?) I needed a dairy and gluten free cake. 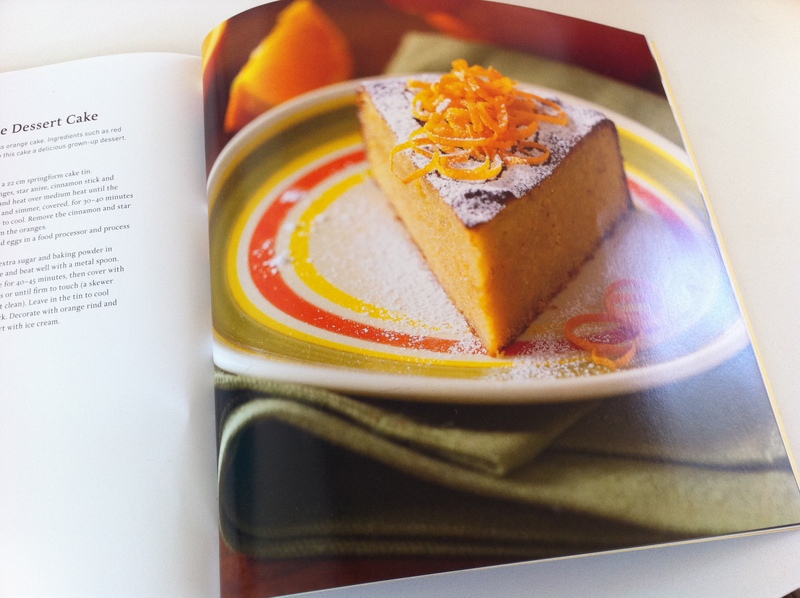 I had a flip through my new recipe book, ‘The Gluten-free Kitchen’ by Sue Shepherd and was delighted to discover that there was a recipe for such a cake, what Sue calls ‘Decadent Orange Dessert Cake’. I was slightly concerned at first as a couple of months ago I attempted a cake with whole oranges and it was a complete failure (I think due to the fact that the blender wasn’t good enough and therefore left rather large orange chunks!). 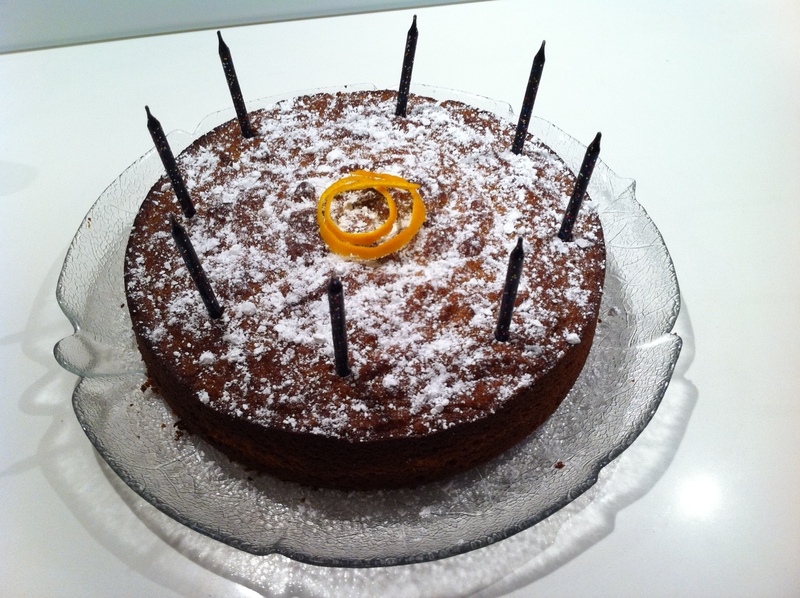 However my Mum and Aunty assured me that the cake would turn out great. I found the cake really easy to make, the cooking time is a little longer than a lot of cakes (you have to simmer the oranges for 30-40 minutes and the cooking time is about an hour and 15 minutes) but it is worth it. The cake tasted amazing and was enjoyed by everyone. Preheat the oven to 180 degrees Celsius and grease a 22cm cake tin. 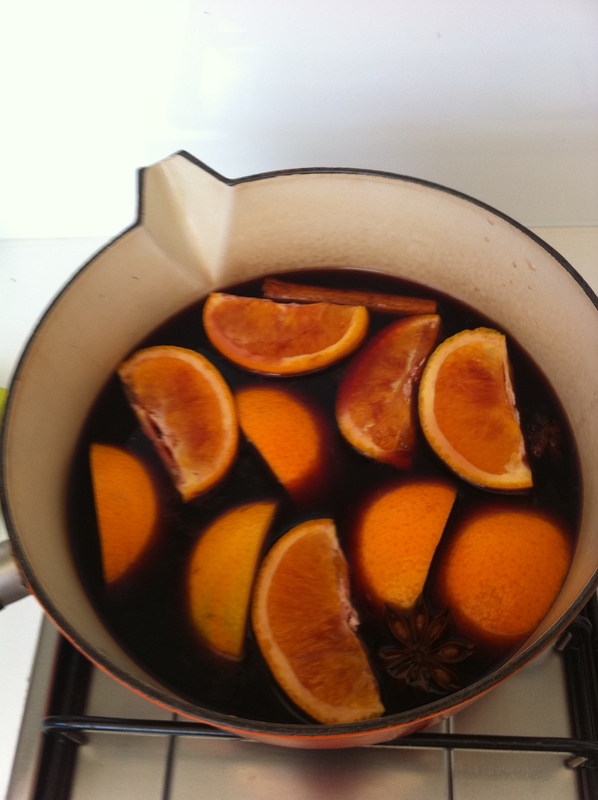 Combine the red wine, sugar, oranges, star anise, cinnamon stick and 1 1/4 cups water in a medium saucepan and heat over medium heat until the sugar has dissolved. Increase the heat and simmer, covered, for 30-40 minutes or until the oranges are soft. Set aside to cool. Remove the cinnamon and star anise from the syrup, and any pips from the oranges. Place the orange quarters, syrup and eggs in a food processor and process until smooth. Mix together the ground almonds, extra sugar and baking powder in a medium bowl. Add the orange mixture and beat well with a metal spoon. Pour the batter into the tin and bake for 40-45 minutes, then cover with foil and bake for a further 15-20 minutes or until firm to touch (a skewer inserted into the centre should come out clean). Leave in the tin to cool completely, then turn out onto a wire rack. Decorate with orange rind and dust with icing sugar, or serve as a dessert with ice cream. heh gonna have to agree with fiona yum red wine in cake!